Hey guys, I’m back! Though this isn’t a normal post for me I thought I’d share the site as, although I only found out about it because they contacted me, it seems like there are some good offers on there. 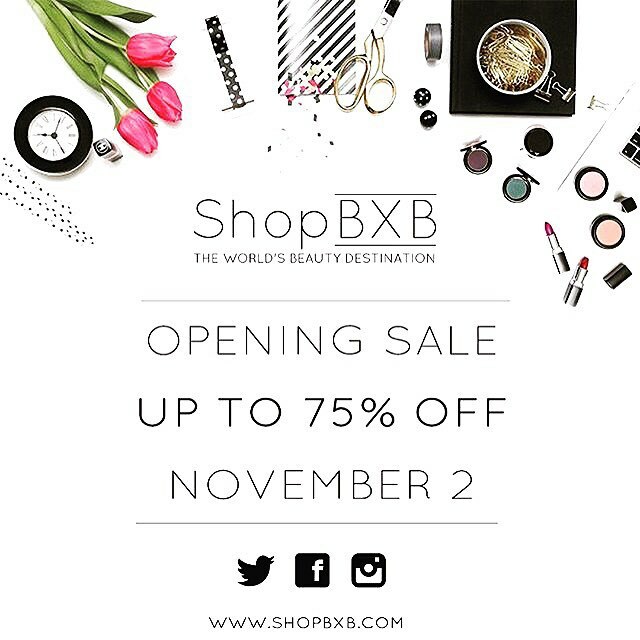 I’m hopefully back to my blogging schedule, though this would normally be a non-beauty day I got this email before ShopBXB opened, I just haven’t been up to doing much and didn’t read the email until last night so this is a bit last minute for their sale. I have been contacted by a few companies but haven’t really felt that I wanted to share any of them but this seems like a really good store. I sort of thought as I’m planning on doing an order with them then it’s worth sharing so other people can see the offers too rather than just making the order and reviewing the products after the sale is over. I have never heard of them before but I’ve had a bit of a nose around on their website and they seem to have some good offers and some of the palettes I’ve wanted are on there at quite a bit less than the only other places in the UK I know are legitimate versions. The store website is here. For the first 48 hours there’s been a sale with up to 75% off, though as it’s ‘up to’ then a lot of them haven’t got a saving that big but there’s still money off on pretty much everything I’ve looked at, even if it’s just £2 or £3. They all seem to be good prices even without this offer, I’ve found a couple of palettes from the Balm, the Balm Jovi one especially, which are about £10 cheaper than other places in the UK even without an offer so it’s a site I’ll probably be looking at in the future if there’s a brand I want to buy from on there just to see how it compares price wise. They’ve extended the sale to the end of November 5th so there’s still time if you want to get something. To see the products at the moment I think you have to share it on twitter, facebook or Instagram. Then they send you a code in an email and you can access the online shop. There are some sets and products that have a really big difference between the RRP and the sale price, I think they’re almost all on the home page. One thing that’s a bit annoying is how the products all show up in USD on the main shop page and only change to GBP when I click on the product to go on the product page. They say that they have 800 companies and 35,000 products which seems like a good range. I think a lot of these are the higher end well-known brands like Nars, theBalm, Chanel (I could go on but the list would be too long) and there are even some Korean brands like TonyMoly, Etude House and Skin Food. I might get some from those brands if they get a better range as the free postage and good prices make it better than the others I’ve bought from in the past. If they ever get the Appletox face cream I use I will be buying at least one as the peach hand cream is a good price even compared to places that ship internationally from Korea. The prices look good and if the customer service and shipping is also good then it’s one I’ll be considering using in the future, I might have to get one of the palettes in the sale as they have free worldwide shipping at the moment. I would say that for some things, the perfumes especially, the savings are pretty high but I’d say it’s going to be one of those sites I use to compare prices, I always shop around a bit before I buy anything anyway, and with the free shipping it does mean that I can get products that are hard to get in the UK without having to pay shipping from America or another part of Europe as often that’s as much as the products themselves! I don’t know how much these things cost in other countries but compared to UK prices they seem pretty good. Have any of you guys been on their site or ordered anything? I’m sure there’s probably a lot of people posting about them recently. I’m probably getting at least the Balm Jovi palette as I’ve been wanting it as long as it’s been out but not found a good place to buy it in the UK, I’m not sure about some of the others as there’s a few things I’d like but I’m really trying not to spend too much with Christmas coming up and getting a beauty advent calendar soon.